This stylish steam inhaler helps you take control of your cold, flu or allergy symptoms while adding a sleek touch to any room. Start breathing easier in minutes by inhaling the warm, soothing mist. Protect your health without harmful side effects by using this natural form of therapy at the first sign of congestion. 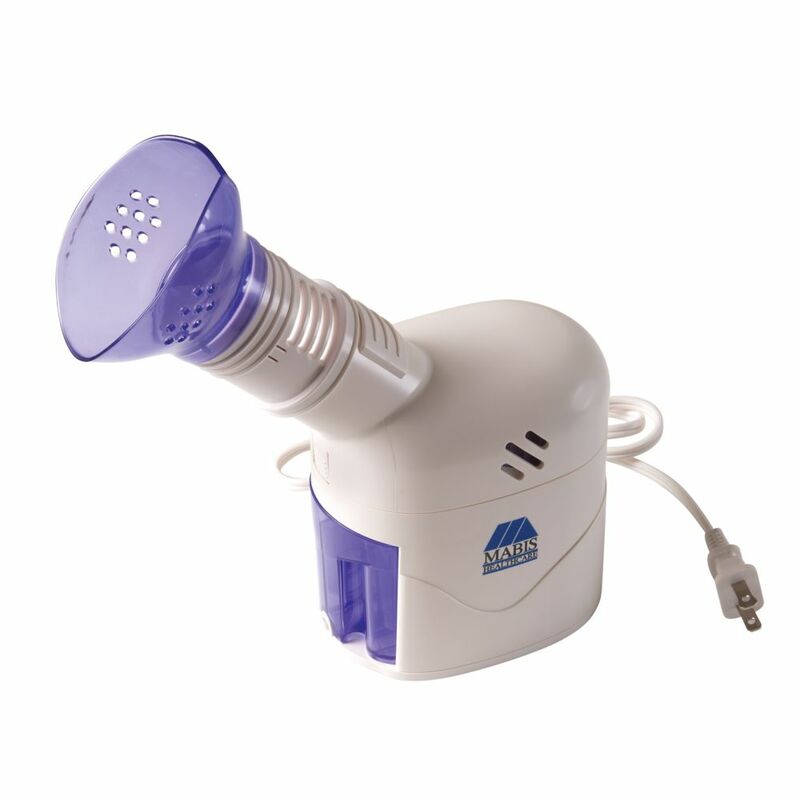 Easily control the amount of steam and size of the particles by adjusting them to your symptoms. You can also enhance the healing effects of the steam by adding your favourite essential oils to the aromatherapy tray. The filter free feature means that you don't have to stop in the middle of your day and replace costly filters or wicks. Sleek and Stylish. This vibrant purple and white steam inhaler will add a sophisticated touch to any décor. Relief for throat irritation, coughs and congestion. Take control of your cold, flu, asthma or allergy symptoms and start breathing easier in minutes by inhaling the warm, moist mist. Adjustable steam control. Easily control the amount of steam by adjusting them to your comfort level. Don't let colds, allergies or sinus problems slow you down. Steam Inhaler Vaporizer with Aromatherapy Diffuser This stylish steam inhaler helps you take control of your cold, flu or allergy symptoms while adding a sleek touch to any room. Start breathing easier in minutes by inhaling the warm, soothing mist. Protect your health without harmful side effects by using this natural form of therapy at the first sign of congestion. Easily control the amount of steam and size of the particles by adjusting them to your symptoms. You can also enhance the healing effects of the steam by adding your favourite essential oils to the aromatherapy tray. The filter free feature means that you don't have to stop in the middle of your day and replace costly filters or wicks. Steam Inhaler Vaporizer with Aromatherapy Diffuser is rated 5.0 out of 5 by 1. Rated 5 out of 5 by mocha from Easy to use and does a great job! I bought this last month and used it a few times. I like it for my lungs and nasal passages - but also love it for a steam facial.